Anti-Semitism must be exposed by the light of truth so it can be soundly defeated – the operative phrase here being the light of truth, and by this I mean whole and entire; with neither attenuation nor ambiguity. On this, surely all can agree. In practice, however, this appears to be a real challenge for some participants in Catholic-Jewish dialogue today, and so perhaps some mutually acceptable “ecumenical ground rules” are in order to bring direction and discipline to our interreligious discourse. For instance, I’m confident that all concerned would readily agree that it’s important to resist the temptation to avoid hard facts, or worse still, resorting to simply telling the other what they want to hear as this sort of pandering, even if well-intended, is ultimately destructive. Furthermore, few would likely argue against the importance of respecting boundaries as it concerns those things that constitute the other’s internal affairs. Lastly, it would only seems logical that it’s helpful, if not entirely necessary, to distinguish between matters historical and those that are more properly considered theological. There’s no doubt we could come up with more useful guidelines, but for now let’s just leave it at that. Common sense though these stated principals may be, they have often been trampled in recent years by both Jews and Catholics alike, and such was the case once again on May 17th when the National Council of Synagogues and the Committee for Ecumenical and Interreligious Affairs of the United States Conference of Catholic Bishops gathered in New York for their semi-annual meeting. One cannot hold to the charge that the Jewish people, either in the first century or at any other time, are responsible for the death of Jesus (the so-called charge of deicide) without falling out of communion with the Catholic Church. It contradicts both Vatican II and the Council of Trent, not to mention a proper reading of the New Testament. This statement raises more questions than it answers. For instance, does Fr. Massa really mean to imply that the Jews of the first century share no responsibility for the crucifixion, and that communion with the Catholic Church hinges on accepting this revisionist notion? Whatever the specific intent may have been, Fr. Massa almost certainly received high praise from those in attendance who are nervous about the prospect of the Society of St. Pius X returning to full communion with the Church; in fact, one is hard pressed think of any other motive for offering these curiously off-topic comments in the first place. In any event, one can only hope that Fr. Massa now regrets speaking so clumsily as to give the false impression that communion with the Church requires one to pretend that the Jews of Jesus’ day had no hand in bringing about the crucifixion of their long-awaited Messiah just as the prophet Isaiah and others had foretold (e.g., cf Isaiah 53). The Gospels clearly state that a “multitude” of Jesus’ Jewish brethren, having been instigated by “the chief priests,” were instrumental in urging Pilate to accede to their demand that the Lord be crucified (cf Mark 19). St. Paul is similarly plainspoken in addressing the Jews, saying “The author of life you killed, whom God hath raised from the dead: of which we are witnesses” (cf Acts 3). One can only hope that any contradictions of Scripture and Tradition on the part of Fr. Massa were inadvertent, but the bottom line is that his statement rendered a disservice to truth, and as such things often do, it set in motion a series of negative consequences. In addition to whatever confusion it may have caused, the perplexing comments in question also served to entice a retort from SSPX Bishop Richard Williamson, whose denial of the holocaust ignited a firestorm of controversy when Pope Benedict XVI lifted his and three other SSPX bishops’ excommunication back in 2009. The Conference of European Rabbis has strongly condemned comments by Catholic Bishop, Richard Williamson, in which he said Jews were responsible for deicide. “Comments like these take us back decades to the dark days before there was a meaningful and mutually respectful dialogue between Jews and Roman Catholics,” CER President, Chief Rabbi Pinchas Goldschmidt said. “There must be no rapprochement within the Catholic Church for those of its flock who seek to preach words of hate,” Chief Rabbi Goldschmidt added. Not to be outdone by Fr. Massa, the CER has provided herein its own concrete evidence for the necessity of the aforementioned ground rules. While we certainly agree that Williamson’s comments merit repudiation, let there be no doubt that Rabbi Goldschmidt and the CER have no moral authority whatsoever to call upon the Holy Father to put an end to his praiseworthy efforts to foster unity between Rome and the SSPX or any other segment of the Christian faithful he is solemnly obligated to shepherd. Indeed, Rabbi Goldschmidt’s own phrase, “within the Catholic Church,” should have alerted him to the fact that his comments concern the Church’s internal forum and are therefore beyond the scope of the “mutually respectful” interreligious dialogue he desires. Perhaps the point would be better made if the Rabbi were to imagine a group of parish priests publically demanding that the CER sever ties with every Jewish community wherein one of its members defamed the holy reputation of Blessed Pope Pius XII. In any event, Pope Benedict has consistently and publically made it known that Catholic doctrine condones neither anti-Semitism nor imputing collective guilt upon modern day Jews. Rabbi Goldschmidt certainly knows this as well, and so issuing a public demand for the Holy Father to now “clearly show” that which he has never ceased to make plain is ultimately little more than grandstanding and another affront to mutually respectful dialogue. As it concerns the call for a “commitment to tackling anti-Semitism” within the ranks of the SSPX itself, perhaps Rabbi Goldschmidt doesn’t realize that Williamson published his comments in defiance of his Superior General, Bishop Bernard Fellay, who not only ordered him to cease publishing the newsletter altogether, but who has also publically denounced Williamson’s outlandish behavior a number of times in the past. Either way, the process of determining whether or not the SSPX in its structures qualifies for full, visible communion with the Catholic Church is purely a matter of internal governance for the Holy See; it is not subject to negotiation with the CER via press release. Lastly, when it comes to referring to the actual event of the crucifixion, the “ecumenically correct” agenda of late reflects a desire to strike all Jewish involvement in the crucifixion from the historical record altogether. Not only is this a surefire way to relinquish all claims to credibility; it’s also hypocritical when it comes from those who treat questioning the historical details of the holocaust as a crime (as it is in a number of European countries). For the record, I wholeheartedly agree that we must never forget the tragic details of the Shoah, but let’s be consistent — either we encourage the human family to face its history with eyes opened wide or we do not. In the present case, very few first century events are as well documented as the death by crucifixion of one Jesus of Nazareth, and while it is a fact that Jerusalem at that time was under Roman rule and the Jewish people lacked the autonomy necessary to carry out the execution on their own, Jesus’ “crime” was not an offense against the state but rather a religious offense as determined by the Jewish leaders of the day, and it was they who in turn stirred up a multitude of the Jewish people to join them in calling for Jesus’ death. This accounting of the events that culminated in the crucifixion is neither Jewish nor Catholic, much less is it theology. 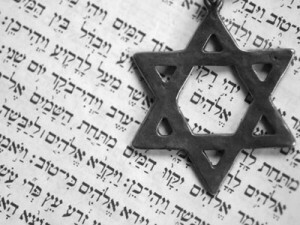 It is history plain and simple, and it serves no one to behave as though anti-Semitism necessarily flourishes at its mere mention; rather, we must recognize that the seed of all hatred is sin, one that grows in the soil of ignorance of that God who is the fullness of truth. Catholic teaching is very clear in assigning responsibility for the crucifixion, stating, “All sinners were the authors of Christ’s Passion” (cf CCC 598), and that means every last one of us — Jew and Gentile alike. I’m married (and for inquiring Catholic minds, validly so) to a wonderful Jewish woman, twenty-three years and counting. I recognize how important it is for Catholics and Jews to join forces in combatting anti-Semitism, but I also know that apart from wielding the weapon of truth — yes, even when it’s inconvenient and difficult to face — we stand precious little chance of prevailing.